So when the kind people at ZOI agency offered to send me a pair of the new summer canvas kicks from Palladium, I balked at the colour choices. I admire people who have the guts to embrace colour, I just question how to wear colourful shoes. Do you try to match? Do you make them the highlight of an outfit? It’s the kind of wardrobe detail that makes one late for work! So I put them aside. That was, until I broke my toenail. I won’t bore you with the details except to say it didn’t happen in any cool way and I swore a lot. But the darn thing didn’t fall off, and I’m not one for self-inflicted pain (unless, perhaps, there’s a prize to be won). So I bandage and soak — and walk carefully to prevent the whole thing from falling off. And, as often happens when we’re forced out of our comfort zone, I found these shoes added a skip to my (albeit cautious) steps. They made me feel like a kid again — I grew up at a time when canvas shoes were the thing to wear in those perfect last weeks of school. 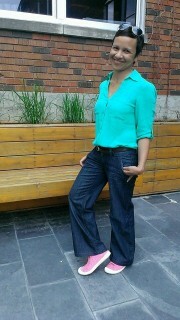 And most of all, I found they went with everything from girly summer dresses to jeans to shorts. Sure, I take a moment to colour-check, but mostly I’m having fun pushing the envelope with these fun flats. 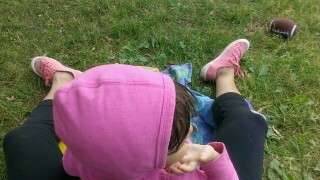 See how my pink shoes match so nicely with my kid’s hoodie-dress? She’s wearing off on me.